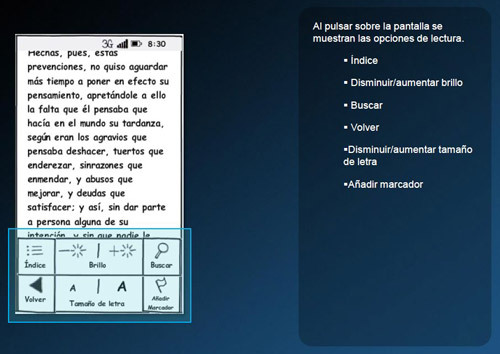 At MWC 2010 Telefónica announced that they were working on an e-book distribution and reading platform, and it was to be ready for Christmas. 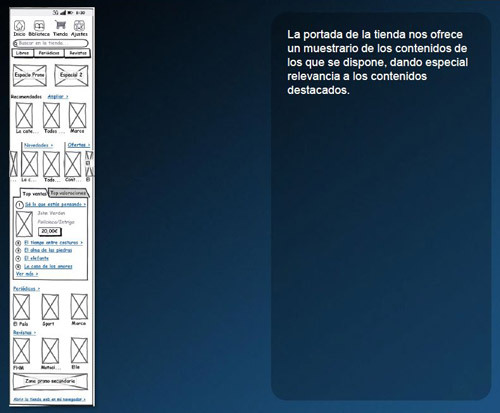 When they had to design its mobile and tablet applications, they turned to Telefónica I+D looking for our help. 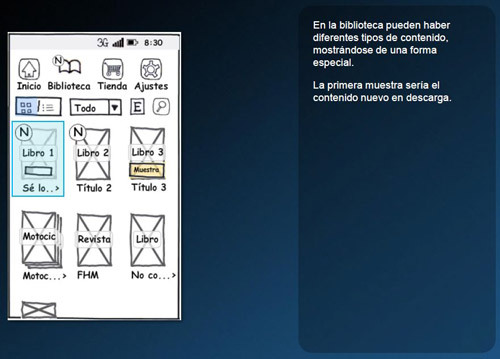 Telefónica had big plans for electronic books, looking to create a distribution platform, eBooks, which could be powered by its wireless network to deliver e-books everywhere. 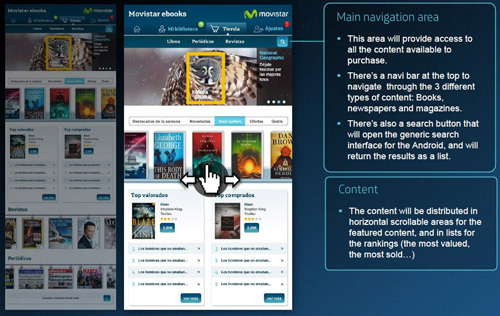 Part of this strategy was creating e-book applications for smartphones and tablets that would allow users read their books, keep their libraries tidy and shop for new books on the move. 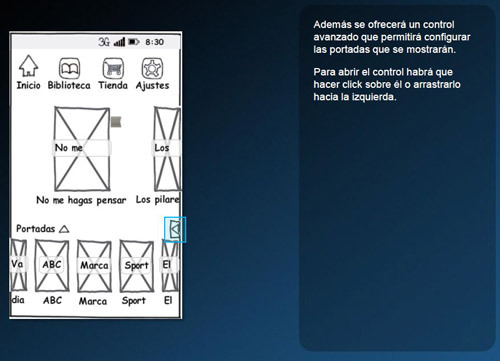 Time was critical, as a limited version of the tablet app had to be embedded on every Samsung Galaxy Tab sold by Telefónica that Christmas. Met with project management and reviewed documentation. 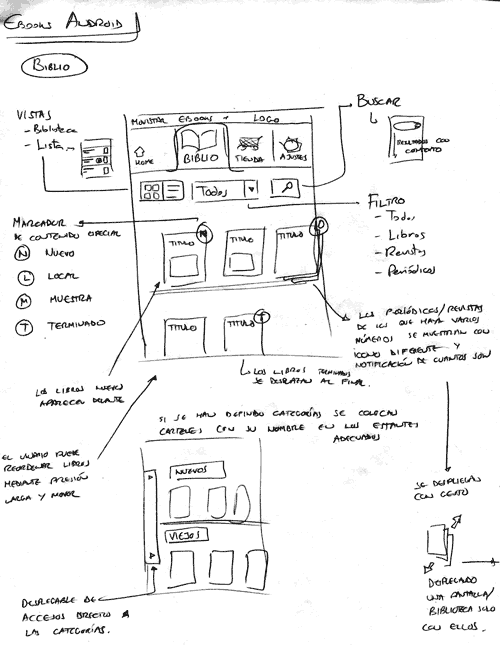 Met with Movistar UX team, who were working on the e-books web platform and PC application, looking to create a cooperation climate between both teams. We kept each other updated on our progress and that helped create consistency between projects. Conducted competitive research on other e-book distribution platforms and e-book reader applications for mobile devices, including ethnographic observation. 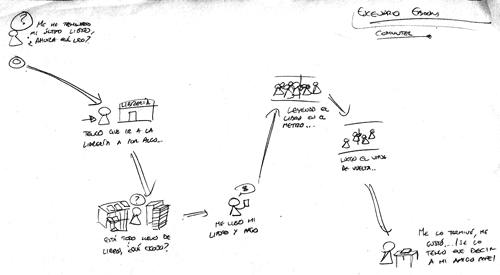 Created simple storyboards for some potential scenarios, looking to current experiences with reading books on the move. 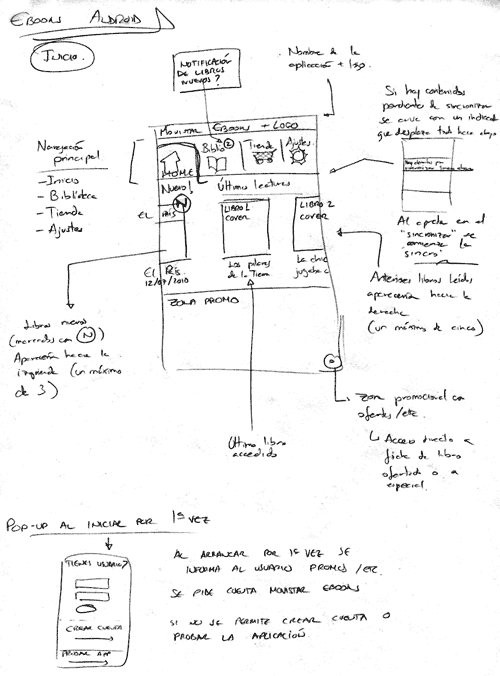 Created LOTS of sketches for the smartphone application (which was the main priority at that moment) and presented them to project management to confirm project’s direction. Speed was key. 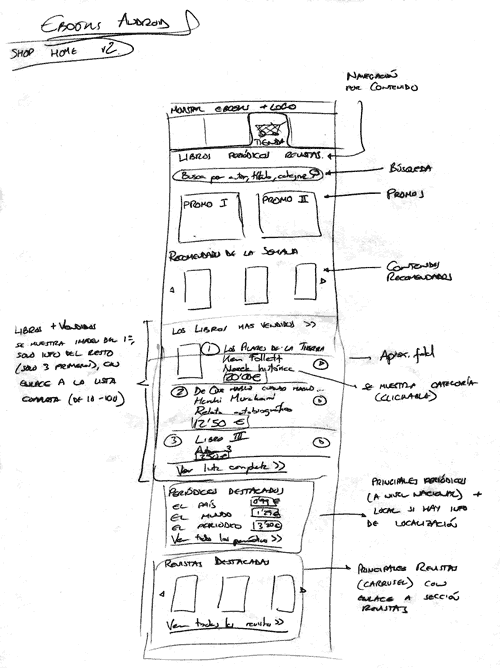 The mobile application shop was critical in generating revenue, so it was studied with particular detail. 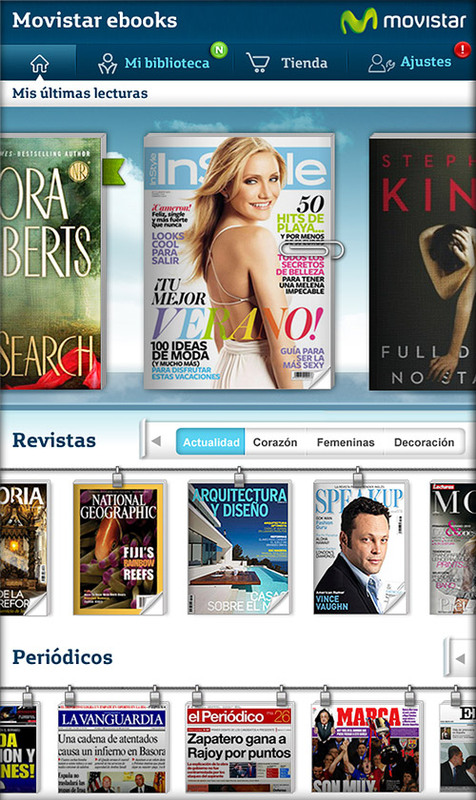 Books, magazines and newspapers would be available, and each kind of content had its own peculiarities. Once direction was confirmed with stakeholders, a proper definition document was created. 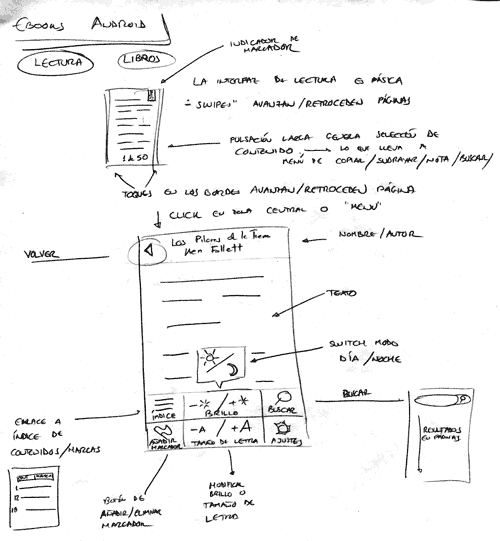 Sketches were turned into Balsamiq wireframes, and sitemap and detailed information were added. 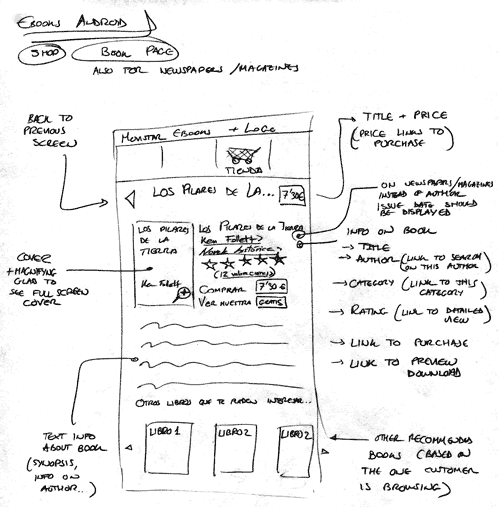 Also, key flows were illustrated with multiple wireframes. 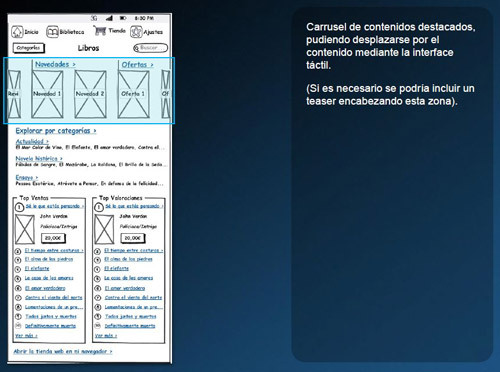 News arrived that Telefónica wanted to embed a preview version of the eBooks application on each Samsung Galaxy Tab for Christmas. 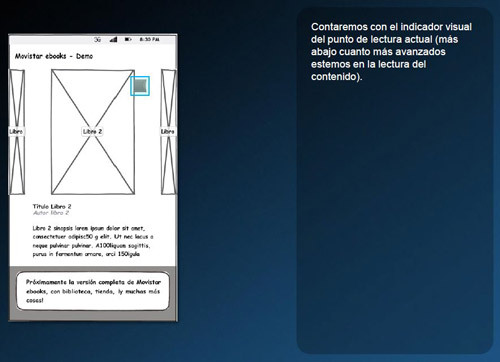 Therefore, the smartphone design had to be adapted quickly to the tablet environment and a preview version had to be designed. 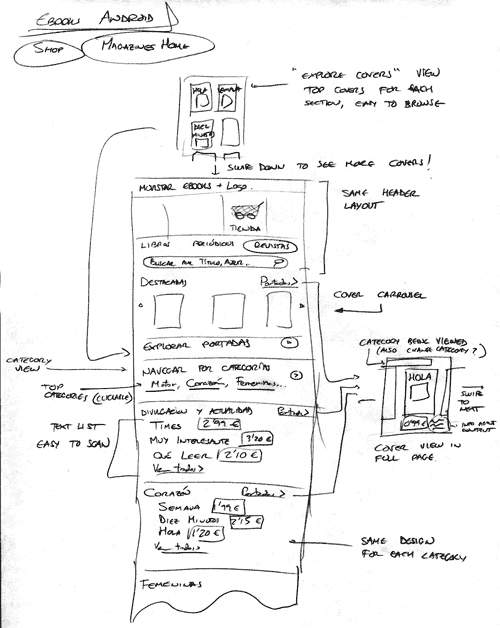 Once the wireframes were accepted, Visual Design team turned them into visual mock-ups including graphic assets, and explanations on behaviors were supported with visual aids. 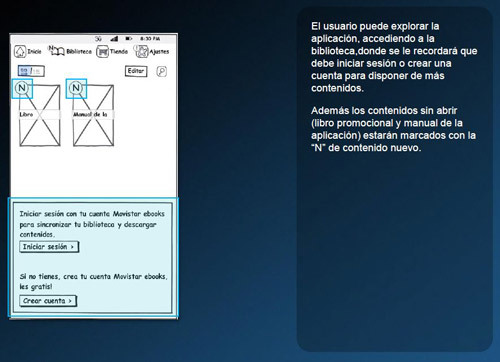 Experience on smartphone and tablet applications. Working under stress, with tight deadlines, and delivering.